The power supply board seemed like a nice place to start since it’s small, really dirty and needs a lot of attention. First order of business was making a sketch of which wire went where coming out of the transformer since I had to cut these wires to separate the transformer from the board. I also took a bunch of detailed pictures of the plugs and wire bundles so I’d be able to plug everything back in when it’s time for reassembly. I read with interest a post about Arp Omni sliders that described a process for cleaning them without removing them from the boards. It involved washing the boards in Simple Green, rinsing them in distilled water and thoroughly drying them. 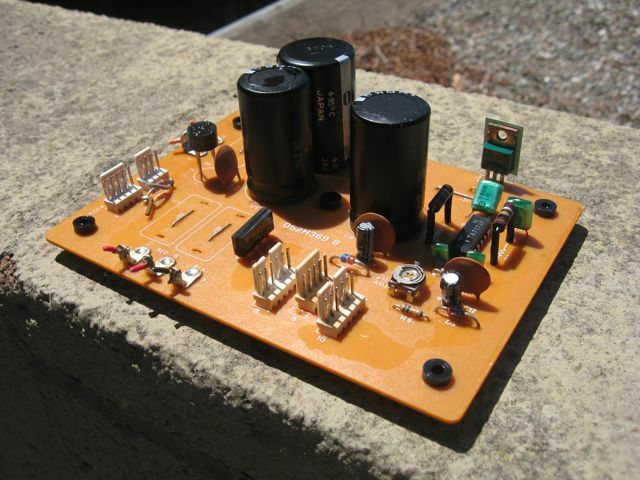 I did this on my Omni 2 and it came out great, so I used the same process on this power supply board. Looks damn good now. All the barf is gone. The plug pins are all clean and shiny. First order of business in an endeavor like this is to see if completion is possible, and if possible, financially responsible. Do not overlook this. Imagine if I did all the work I propose to do, spent all the money on missing parts and all 12 of the $40 – $60 a pop voice/filter chips were bad. That said, near as I can figure there are two parts you can’t readily buy or make yourself: IC’s IR3R01* and IR3109. There may be other dear chips in this machine but it shares these two with the mighty I’m-gonna-have-to-get-me-one-someday Roland Jupiter 8. If more than one of the combo of 12 of these chips is bad in your Juno 6/60, you might as well buy a parts machine or part out your machine. to mine: Yer gonna have to click more to see! 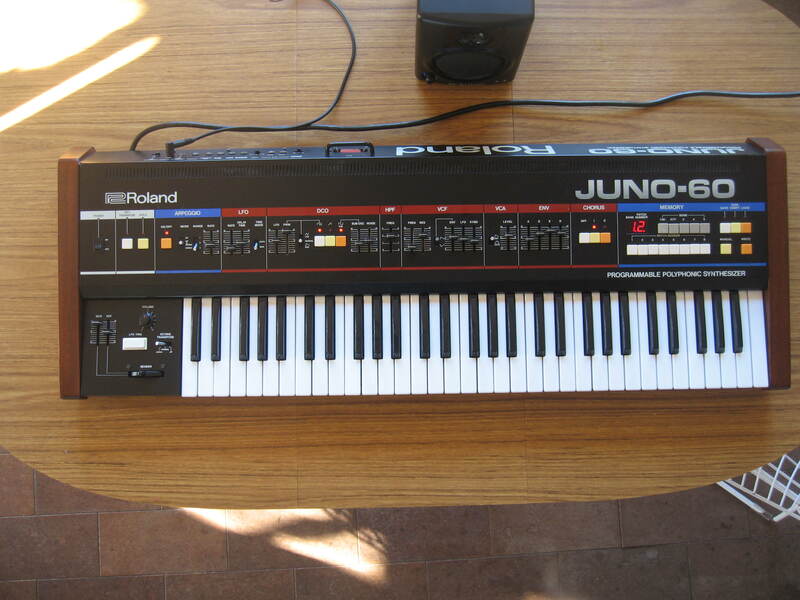 Roland Juno 60 part 1: project or parts? I have a soft spot for hard luck cases; a trait you will come to recognize in me if I can manage to keep this blog up. 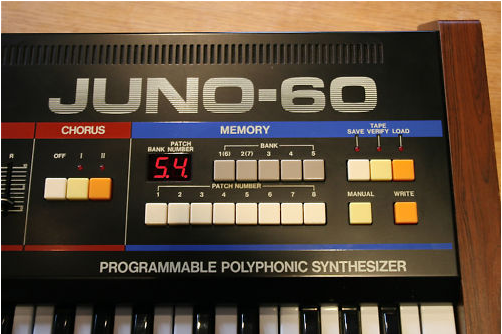 Case in point is this Juno 60 that I bought off Craigslist today for what I consider a good price. Tape is for ‘transport’ as there are no screws holding it together. Yes that’s a penny peeking out where the D key should be -had a decent jingle worth of change rattling around in it. Randomly or perhaps opportunistically is how I have filled out my instrument collection. 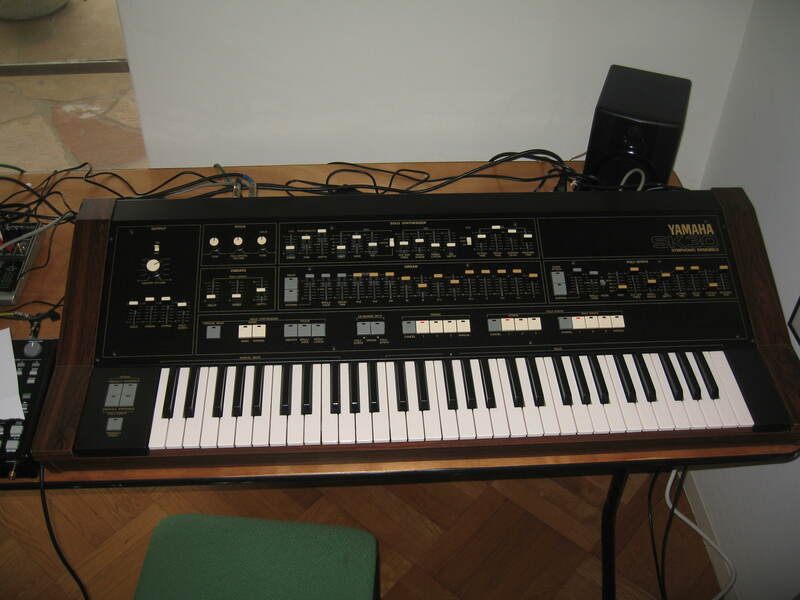 This Yamaha SK30 was on Craigslist -I had never heard of the SK line but it looked neat. I emailed and was the second guy to respond. I sent my hone number and tried to arrange a meet up. After 2 weeks of silence I sent a ‘hey -if you’ve still got it…’ email. A week later the seller responded and the next morning I was driving home with this in the back of my station wagon. During those three weeks I read up on the SK series of analog synthesizer/organ/string combo keyboards and got this impression: robust/reliable construction, great Hammond B3 emulation when combined with a Leslie, good fat synth bass, limited but none-the-less fun synth and the ability to mix all the voices. The SK30 -massive -well, not as massive as the SK50d or CS-80, but still almost approaches the 90 pounds Vintage Synth Explorer claims! 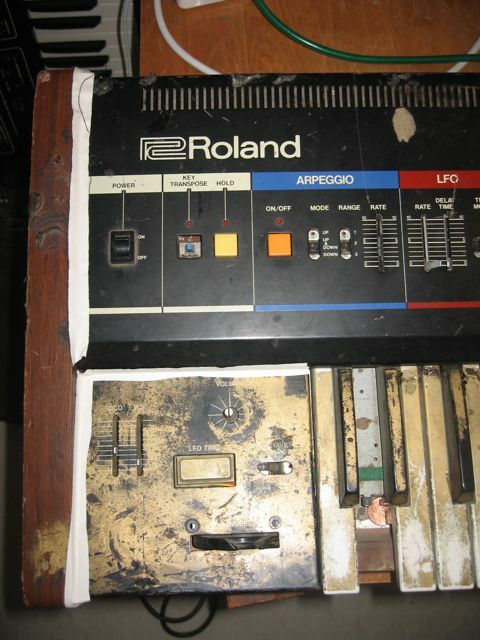 Notice that all the slider knobs are parallel -not usually the case with 30 year old synths that are regarded as toys. In part 1 I talked a lot about my fumbling for a solution. 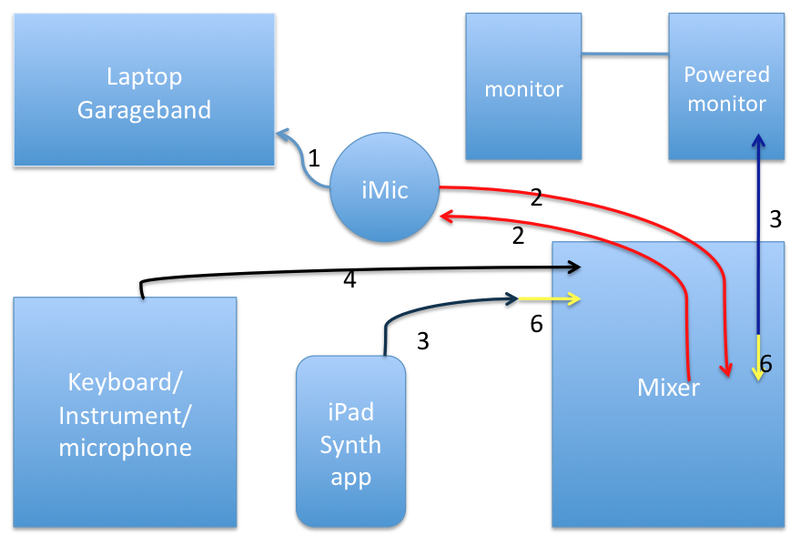 Here’s a diagram of what I am using now -a very compact set up. I am using powered monitors because I have them -one could easily use a home stereo, boom box or headphones. 1 is the USB cable that’s an integral part of the iMic -it plugs in to a USB port. 2 is an RCA stereo to 1/8″ male stereo cable -one goes from iMic 1/8″ out to RCA tape in, the other goes iMic 1/8″ in to RCA tape out. 3 is a 1/8″ male to 1/8″ male stereo cable. One connects iPhone or iPad 1/8″ out to mixer input of you choice. The other connects the mixer headphone jack to the monitors. 4 is a 1/4″ male to 1/4″ male mono instrument cable. Plugs instrument to mixer. 6 is a 1/8″ stereo female to 1/4″ stereo male. You get the idea. I seem to have omitted 5… sorry about that!